What is the brick to brick size Height & Width of your (door opening) if considering columns what is the height from floor to top of your door. 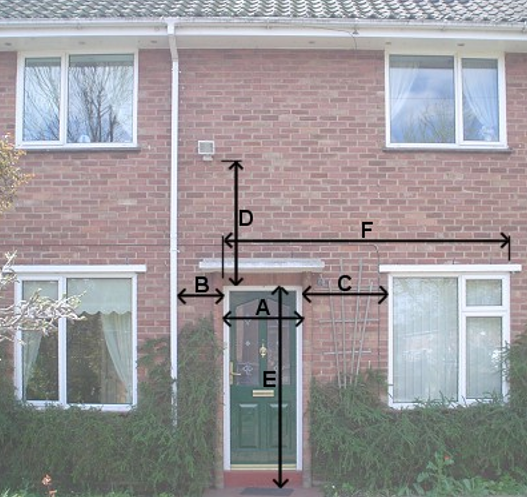 Are there any restrictions either side of the door measure to the obstruction such as a window or down pipe. In some cases you would need to measure to the end of your house wall if the door is next to the gable end or boundary line. Are there any height restrictions measure the height from the door to the obstruction as in picture there is a light. If you want to cover your door and window with the canopy you would need the measurement from the edge of door to the edge of window and measure the sides for any restrictions boundary line or gable end.